It took three agonizing months before a combination of doctor and insurance approved referrals granted me time in physical therapy. That was late January 1998. In order to start my balance re-training a baseline was required to establish my current abilities and chart any progress associated with my physical therapy. This baseline was established in a contraption called “The Balance Master”. Why it’s called a balance master was outside my comprehension since without a sense of balance, I couldn’t imagine how I could “master” anything! In spite of my imagination the tests began. The Balance Master reminded me of days gone by telephone booths, but missing the door to let you in. It has three walls, one I faced and two sides to the left and right of me. There are different colors of various shapes painted on the walls and a computer like screen in the facing wall that during the test produced a guiding line of “balance” that I was instructed to look at. My feet were strategically placed on a raised area on the bottom of the booth. 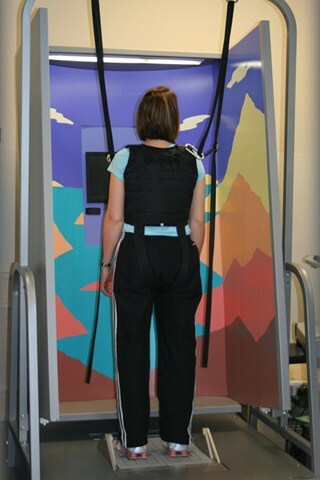 After being secured in the harness I was positioned just right and the test began. The walls of the booth titled front to back and the bottom where my feet had been strategically placed tilted front to back. Each movement put me into a complete panic and within seconds of the test my legs flew up in the air and I was left dangling and suspended as if my parachute had landed me in a tree. Tears flowed from my eyes adding yet another layer to feeling of out of control and unsure of anything. I tearfully begged “Get me out of here.” My body shook with fear; I was embarrassed I wasn’t able to accomplish something as simple as just standing. In my panic the physical therapist removed the harness and helped me to a chair where I sat and sobbed. I was completely overwhelmed with fear and again the true sense of loss seeped into the core of my being. It was true; I really was experiencing this nightmare, live and in color. “You can do it Cheryl. Just take a rest and try again.” My best friend Linde and now physical therapy coach tried her best to encourage and comfort me. But as I sat there shaking I just could not find a reason to step back into this newly realized nightmare. It took some time before the kind and supportive words from my friend and the physical therapist convinced me that I had enough strength to get back up and start again, and again, and again, and again… Each time the test was run the same fall and tears happened but we tried again. The baseline was basically a zero. For years it was just that, a series of zeros of trying again and again. With each zero I realized I would be restarting a journey down a long weary road with detours leading to many attempts of trying again. In spite of my fears and the agony of constantly wobbling and falling I faithfully attended the three months of physical therapy appointments. I put on a funny and optimistic attitude, but deep down I fought with a continuous battle of being in limbo between two parallel worlds; my life before and the new life I figured I had to somehow make friends with. With the first three month round of physical therapy complete there was a three month delay with another referral and approval process to allow another three month round of PT torture. In those six months of PT the one and only thing that stuck with me was the phrase, “feel your feet”. When I completed my final round of PT I didn’t feel much different. While in the thick of it I worked on sitting on a big bouncy rubber ball, working on getting up and down from a sitting and standing position, standing with my eyes open and closed- like I could accomplish that… I think that the eyes closed was added for a PT laugh… another PT exercise was to make my way through a maze taped to the floor. PT was so fun – NOT! I asked my therapist why we couldn’t go outside in the real world and practice there but only received a response that this is the way they had to do their work. Well, that’s not the way I wanted to do my work. When my PT time ran out I was sent away still with the phrase “feel your feet” stuck in the head. That phrase may have helped me feel my feet on the ground but it led to a full out body confusion and conflict of what to do with the rest of my body; the parts that flailed and wobbled every which way to Sunday. I was a walking bobble head and human puppet push up toy. Despite the wobbling and collapsing I began my own PT, inside and outside of my home. I used pieces of wood propped up on a step and tried to stand on it. I tried imagery using music as I attempted to close my eyes-both of which were not easy tasks and often failed. I worked on walking around my house without touched points, I tried to be what I used to be before this new life took over. Then, as I had asked my physical therapist, I decided to go outside, into the real world. What a sight to behold! By this time I began to use a cane as a third point of reference to somehow make walking a little easier. I walked like a drunken fool up and down hills, straight-or rather a zig zag-forward, on even and uneven sidewalks throughout my neighborhood to trying to master my gait. I even tried walking around in my back yard. None of these were easy tasks and always left me exhausted. I heard a rumor going around town that my walks were proof that I was the drunken fool I looked like. So, in a sinister kind of way, I decided to fuel the rumors by putting a bottle in a brown paper bag and take it on my walks. I figured that ought to give the town something to talk about! This entry was posted in Disability, Gentamicin, Identity, Inspiration, Motivation, Non Fiction, Oscillopsia, Ototoxicity, Perception, Physical Therapy, Rehabilitation, Research, Resilience, Self Help, Sensory Substitution, The Noise of Disability, Tongue Display Unit, Transition, trauma, Vestibular System and tagged antibiotics, Bill Angelos, brainport, cheryl schiltz, Dr. Mark Pyle, gentamicin, madison, Madison College, Mitchell Tyler, norman doidge, Oscillopsia, ototoxiciity, paul bach-y-rita, perception, silencing the noise of disability, Subject Zero, Surgery, TDU, University of Wisconsin, Yuri Danilov. Bookmark the permalink.